My husband Randy has traveled for work ever since I have known him. When we first met, his trips were few and far between and I was grateful for that. When we moved to London, work trips were much more common which I was also grateful for because I got to go along to places like Paris, Tallinn, Stockholm, Amsterdam, Brussels, and Tel Aviv. These days he is traveling more than ever before and I’m not grateful at all. Just in the last six months he has gone to New York 5 times, Dallas, Atlanta, London and Dublin, San Francisco 3 times, Cannes and Paris, Chicago, Cincinnati, and D.C. Over the summer, he traveled for 9 weeks in a row. Having him gone is hard on our family. The boys don’t understand why Daddy is on an airplane again. Running the household and caring for the boys falls squarely on my shoulders. I miss him when he is gone. I try to keep busy with friends and family but it does get lonely. The travel is hard on him too. I think in the very beginning it seemed exciting to him. Going to interesting cities, meeting interesting people, sleeping in a different hotel room each time – 10 years ago that was all cool. Now it’s a lot of jet lag, sleepless nights in strange beds, delays in airports, and unhealthy food. Randy is lucky in that he is going to dynamic cities with terrific restaurants. But the fact remains that eating out all the time is not very healthy. Just as I crave steamed broccoli and salad whenever I come home from vacation, Randy craves my food. Clean, healthy, low in fat, and seasonal. I am always happy to cook for him but never more so than when we are reunited after a long trip. I usually don’t put that much effort into cooking when he is gone and I am happy to get back to the dinners we enjoy together and the time spent in front of the stove. 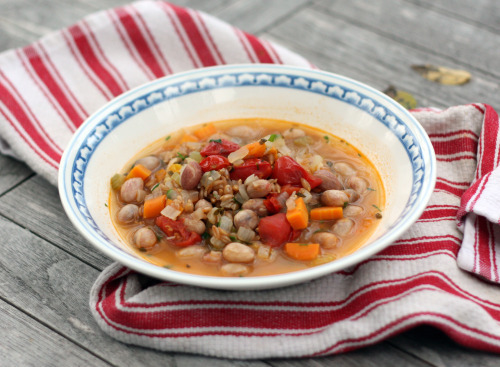 I came up with this soup after a trip the farmers market revealed that we are once again in fresh bean season. I treasure this very fleeting time in the produce world. There are several farmers that have beans in their pods at their stalls, but my very favorite one sells boxes of fresh beans already shelled. What are they? These are the beans that most of the year we all buy dried – or even canned. Here they are fresh. Actually, the ones that I like best, the cranberry bean, is very hard to find dried and basically impossible to find canned. The fresh ones still need to be cooked, but there is not pre-soak required and they cook up in about 20 minutes instead of the 1-2 hours required by most dried beans. In addition to the convenience and less time on the stove, the flavor and texture is unlike any dried bean you will ever encounter. They are incredibly plump with a delectable creaminess and a subtle earthy flavor. I often find beans to just be starchy but that word doesn’t even come to mind with the fresh beauties. We only have them in our markets for a month or so, but each year I buy a lot of them and store them in my freezer. They can be added to things like soup or stew without even being thawed which makes them incredibly useful. 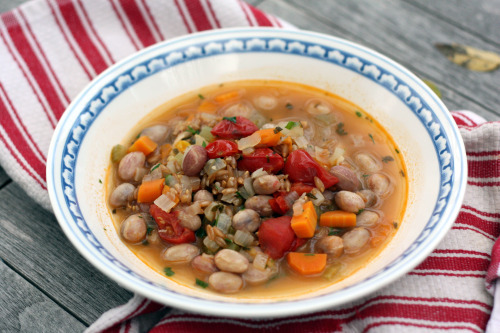 If you aren’t able to get your hands on some of these beauties, feel free to your favorite canned or dried bean for this simple, rustic, and hearty homecoming soup. If you are going to use dried beans, I would cook them first and add them as directed in the recipe below. If you are going to use canned beans, I would add them about 10 minutes before you are going to serve the soup so they don’t get too mushy. A cannelini or other white bean would make a fine substitute. I like my soup very thick but if you like yours brothier, add another cup or so of water. Place a large soup pot over medium heat. Add just enough olive oil to coat the bottom of the pan, then add the onions and a large pinch of salt. Sauté until slightly softened, about 5 minutes, then add the garlic, carrots, and celery. Sauté for about 6 minutes, until the carrots have lost their crunch, then sprinkle in the sage, thyme, and smoked paprika. Stir for two minutes, then stir in the tomatoes. Add the farro and cranberry beans. Give it a good stir, then pour in the water. Add another pinch of salt, a few grinds of pepper, and the bay leaf and turn up the heat to high until the mixture boils. 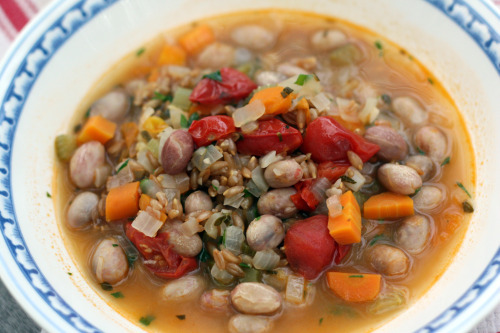 Turn the heat down to a simmer and cook, uncovered, until the beans are soft and the farro is cooked through but still retains a bite, about 20 minutes. Stir in the parsley. Taste for seasoning and add more salt and pepper to taste. Your soup looks great. I have a husband who travels a lot, but not nearly as much as yours! (Or to places so exotic.) It’s always great to have him home. What a nice way to welcome him back! I wish we could buy fresh beans here. We have a great farmer’s market, but I have never seen them. I’d be curious to taste the difference. That sounds like a lot of time spent apart, missing and longing for him. I lived in a different country for almost a year away from my fiance when the relationship was still new and all we wanted to do was to be together. I remember how hard it was to be apart. I’m sure it gets even harden with kids – they must miss him terribly too. I love your writing style. You have such a wonderful writer’s voice, and I always love to return here to your blog. Again, what a warm and lovely post! I will bookmark the recipe too – yum!! Fresh beans already shelled are like a treasure. After spending hours shelling, I understand and gladly pay the higher price for beans ready to cook! Your soup looks like a great welcome home. Sage and thyme are so good with beans. This is my kind of soup, especially after a rainy weekend. And I know exactly what you mean about lacking effort to cook when the husband is gone, although mine isn’t gone nearly that much! That’s a lot of travel, I’m sure he’s very thankful for your cooking. I can only imagine how much you must miss Randy when he’s gone and with food as good as yours, I’m sure he craves it from the second he walks out the door! This soup sounds fantastic! I haven’t seen fresh beans at our farmer’s markets here…maybe I just need to keep my eyes better peeled! loooooooooooove your photos!! So glad yer taking shots outside on that awesome table! I especially love the little leaves in the background. Randy is lucky to come home to this! I’ve never made anything with cranberry beans before but I’ve always been intrigued. Coming home to a delicious, healthy, home cooked meal is the best after traveling. Josh had a nice meal waiting for me after Blogher Food. It hit the spot. We missed you this year! I will be trying this recipe soon! That is a lovely soup. It sounds so hearty and comforting… Perfect for the fall! Thanks for sharing! When Cornelius went on his 2 week bike trip this summer, it was the first time in 7 years that we had been apart and I found cooking really hard. It was so much easier to just snack throughout the day. I had to invite people over just so I could get back into the routine of having a proper meal. Your soup does look delicious and I’m now going to see if I can find fresh beans (I haven’t seen any but that doesn’t mean they don’t exist around here). PS And I second Tracy’s comment about photographing on your outdoor table. Yay! Love the photos, Dana! I love this post(well I love them all) but mostly because I can relate…I’m staring down 2 weeks of Matt in Dublin and Hong Kong in the next month and I know that the higher he climbs (I hope) the worse it will get and get harder for Carson and Brooklyn oh and me too :). I am glad I am in good company. ;-) I should make this soup too!